Re-entry into the real world after three weeks of single focus and nearly complete disconnection is always a difficult adjustment. I promised Beat an update on my own blog so I'm attempting a quick post. My friend Liehann and I finished the Race Across South Africa just after 10 p.m. on Tuesday, July 1, after 21 days of riding, pushing, shoving, and carrying our bikes along the rugged contours of the country. It was an incredible experience to explore South Africa in depth and visit corners that very few people see. 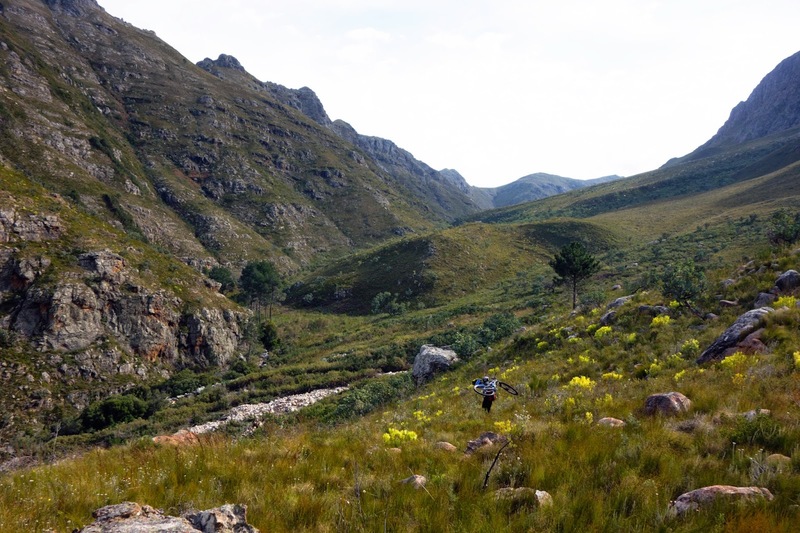 The route was brilliantly and sometimes diabolically devised to keep riders as far off the beaten path as possible, and for an American in South Africa even the beaten path feels far away. It was culturally dynamic and physically challenging in ways I didn't expect. 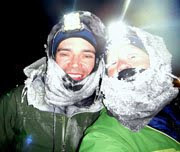 Our days were generally (but not always) shorter than I'd become accustomed to in past multi-day endurance events, but the daily challenges were more mentally strenuous and sometimes brushed against the limits of my physical abilities. Not working on upper body strength or practicing carrying my bike up steep, loose terrain was the biggest mistake I made in preparing for this event. Liehann was a great riding partner, usually upbeat and patient with me in the areas where I struggled the most, which were (unsurprisingly) navigation pressure and fear of being lost in a foreign country, and (quite surprisingly to me at least) the hiking portages. The middle segment of the route featured a seemingly endless string of three-meter-high game fences to hoist our bikes over, and for that and many other reasons there is no way I could have completed this route without his help. The Freedom Challenge is well organized and makes it possible to ride this remote route with fantastic support from Native villagers, farm houses, and a few hotels. We met many wonderful people and spent time in fascinating places, one of the most unique being a night spent in the village of Vuvu inside one of the villager's huts. Commercial services are few and this route would be a difficult thing to complete fully self-supported, so the race organization has created a great opportunity with this tour. And of course Beat was at home monitoring the tracking page and updating my blog. His support from afar was fantastic and his device worked great. Although it couldn't help much on the many cow paths, farm road mazes and off-trail bushwhacking, the gadget was consistently accurate at gauging intersections on even small dirt roads, which was frequently reassuring. I've been off the grid for so long I'm not even sure where or how to begin re-entry. I'm in the Cape Town area for a few more days, hopefully enough time to visit the coast and see a penguin, and then it's back to California finally on July 5. I'm looking forward to coming home. There will be more to come. Thanks for checking in. I happened to check in on your tracking site as you were just arriving at the finish, it looked like a tough day! Looking forward to your description of the ride and the usual great pictures of your experiences in SA! Congrats Jill! That was a fantastic accomplishment and an incredible adventure. Look forward to seeing some of your pics. Thanks Beat for setting up the website so we could follow the daily progress! Thank you for the update - I've been wondering how you are! I've have followed your progress throughout the race and was thrilled to see you finish yesterday. I look forward to hearing all about it and I wish you safe travel home. Congratulations Jill. What an adventure. I am looking forward to reading more details. Yay! Eagerly awaiting your report and pictures. Thanks to Beat and Trang for the updates. It's so stressful being an armchair adventure traveler! haha! Love your blog Jill, travel safe. Welcome to the tribe of blanket wearers. Roughly 170 individual men and 20 women have earned their blankets since the inauguration of the race 10 years ago.. RASA is an unfiltered, unglamorous, adventure race, I look forward to reading your updates, especially on how it has changed your perspective of, well, everything. Have been following your progress and look forward to hearing more about the challenge and your journey through South Africa and seeing your always wonderful photographs. Congratulations! Congratulations!!! Sounds like this was very different from the TD in many, many ways. Can't wait to read all about your experiences. Congratulations, Jill and Liehann. It was great to be able to track you along the way and get updates from you, Trang, and Beat. Can't wait to see more pictures and here more about it. Congratulations, Jill and Liehann on another epic adventure. I thought you folks got stuck because the jumpertrax still has you at Trouthaven for the past few days. Glad to hear you finished and in good time. Definitely looking forward to your notes, thoughts, and feelings about the race and about South Africa, one place I'd go back to in a heartbeat. Totally amazing. Congratulations. Todays pic is stunning. Looking forward to reading and seeing the whole saga.